A while ago I wrote an article describing how I was about to do a planing demonstration, but the site couldn’t find any bench dogs that fit the holes in their bench. As a very short recap, I screwed together a dowel and a thin piece of wood, which effectively took the place of a bench dog, and I continued my demo. This morning, I planned to plane some small cherry boards I’d resawn a couple of days ago. 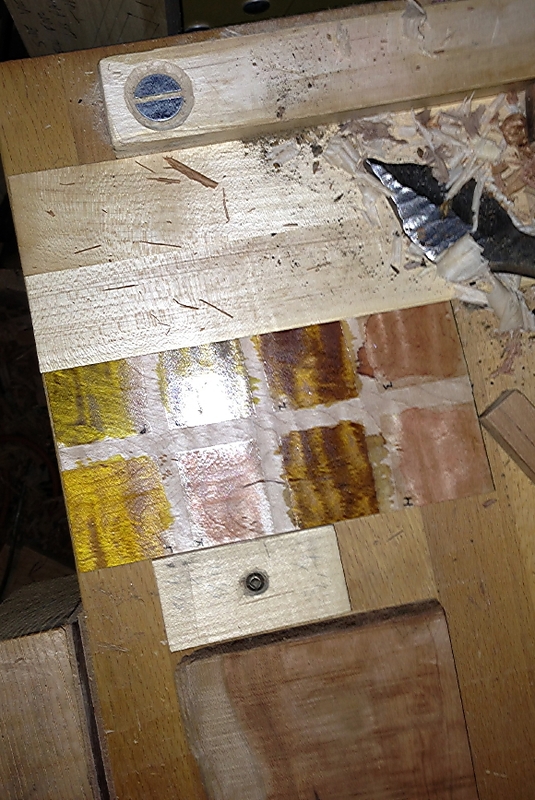 I wanted to plane away any saw marks, and get it down to a smooth surface. I decided I’d use my old shop-made bench stop, since the stop portion is thinner than the boards I needed to plane. After a couple of strokes with my plane, I was fighting the stop , as it was rotating off to the side. Since the bench has round holes, and the vertical piece of the stop is a round dowel, there is nothing to prevent this rotation. I have a taller stop attached to the end area of my bench, but it is too tall, and isn’t adjustable in height. 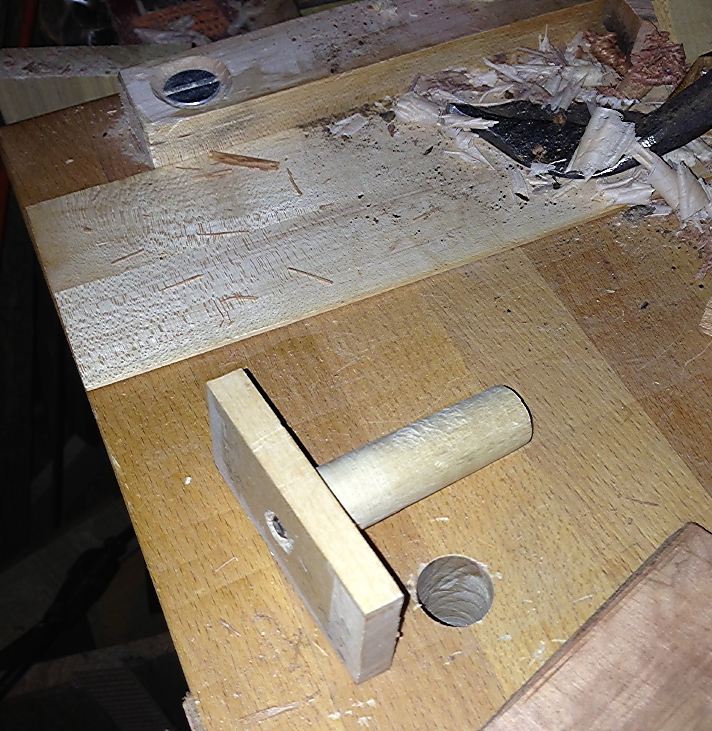 I also have a very thin piece of maple attached to the permanent stop with a hold-fast, but the plane would hit the taller stop before reaching the end of the board. 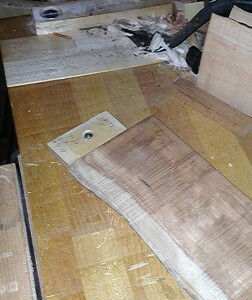 Unfortunately, there was also a fair amount of room between the thin maple piece and the back of my rotating stop. I found another thin maple board in the shop that I could use to fill this extra space. 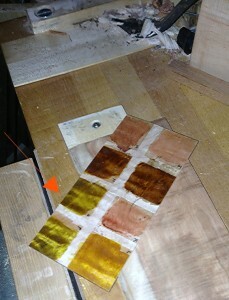 I had used it as a tester for some dyes on an upcoming finishing job on a guitar I’m building, but since I’ve already decided what color I plan to use, I no longer needed to retain my color-testing board. I checked to see if this thin board would fit between the rotating stop and the other maple board. The new board was about 1/4” too wide. 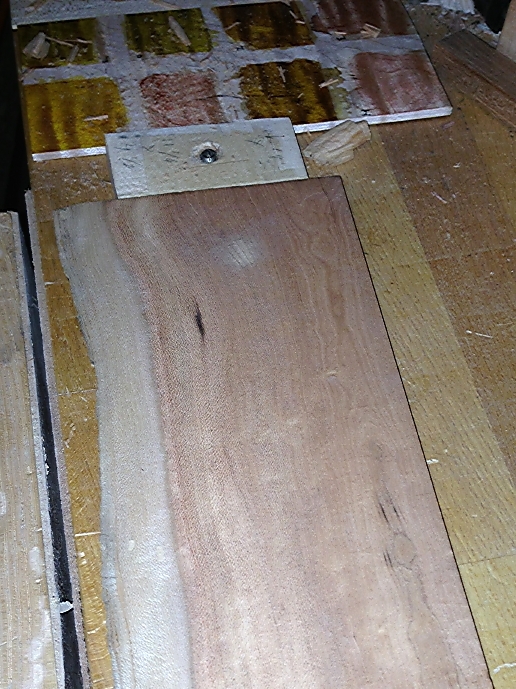 I quickly set my bandsaw fence and ran the board through the blade, taking off the excess wood. 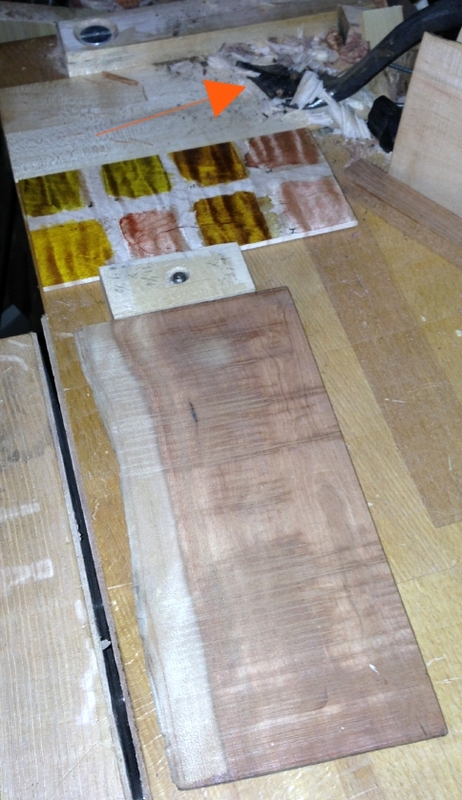 When tested, the newly dimensioned board fit perfectly between the shop-made stop and the existing thin maple board. I again put one of my cherry boards against my shop-made stop and I was able to plane the full width of the board, without it rotating wildly. In a couple minutes, I’d planed both sides of the three cherry boards, with no further issues. Success! While this specific situation may not ever occur in your shop, I hope this article might plant a seed, as it is great to come up with your own low-cost solution to a problem. I’m sure you’ll find just as much enjoyment discovering a solution as I did. Let me know if you have any questions or have a cool solution to a problem. I’ve cut planing stops from surplus laminate flooring. They need to be firmly clamped, and it’s a useful way to use up leftovers and offcuts. Morton’s Shop: Concealing elongated screws 2012 Rikon Pro Bandsaw Giveaway: Interview with the Winner!